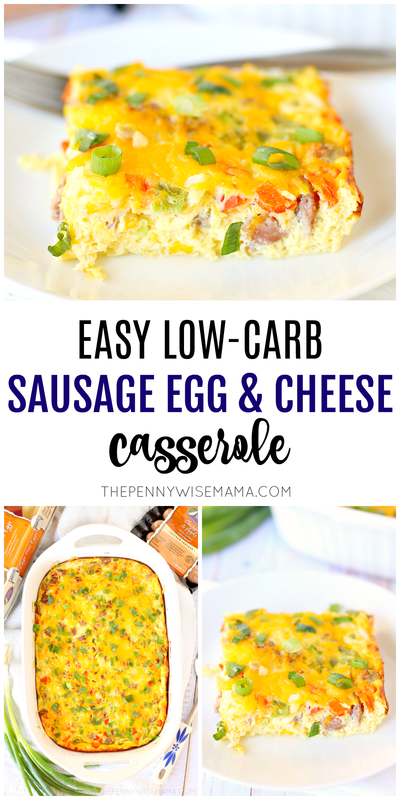 This Low-Carb Sausage Egg Casserole is perfect for feeding a crowd or making ahead for busy mornings. 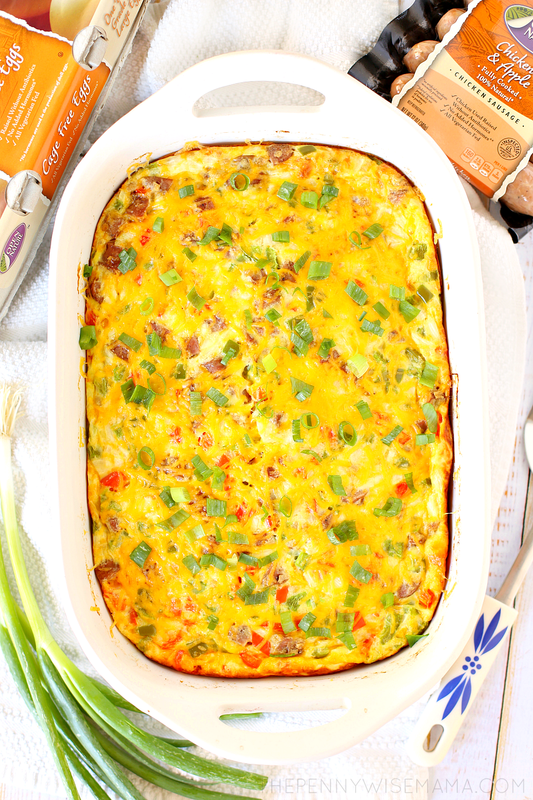 Featuring fresh veggies, cheddar cheese, and Open Nature® Chicken Apple Sausage and Cage Free Brown Eggs, it’s full of flavor and easy to prepare! Read on to get the full recipe below. I partnered with Safeway to bring you this post. Breakfast is the easiest meal of the day, but it can also be the most boring if you don’t switch it up. I tend to eat the same thing every day — sunny-side up eggs, turkey bacon, and sliced avocado. It’s a delicious combo, but it does get old after a while. 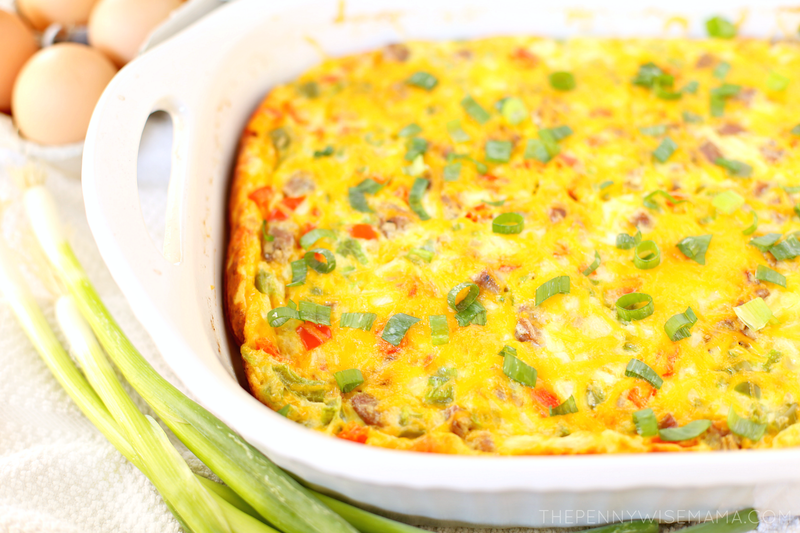 Recently, I’ve made it a point to cook up some other low-carb alternatives like this Sausage Egg Casserole. I made it the other day and it was a huge hit with the whole family! 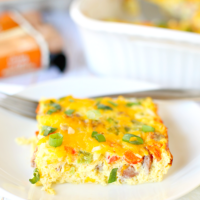 Egg casseroles are yummy and super easy to make. The best part is you can customize them in so many different ways simply by adding different meats or veggies. I like to make mine with bacon or sausage, and whatever fresh veggies I have on hand. 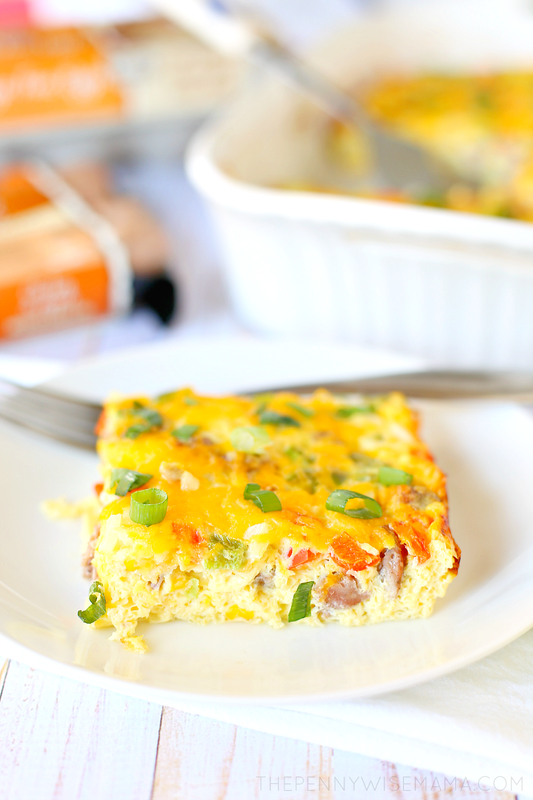 This recipe for Sausage Egg and Cheese Casserole is one of my favorites because it’s so quick and easy to prepare. To make it all you need are eggs, milk or half & half cream (cream has less carbs), chicken sausage, shredded cheddar cheese, onion, bell pepper, and salt and pepper to taste. I like to use Open Nature Cage Free Brown Eggs because they taste better than regular store-bought eggs and I think they are better quality at a value compared to other national brands. The key to this recipe being so delicious (and easy!) is using Open Nature Smoked Chicken Apple Sausages. Not only are they 100% natural and taste great, they are also fully cooked, so all you have to do is cut them up and add them to your casserole mixture. I buy them at my local Safeway, but you can also find them exclusively at all of the Albertsons Companies family of stores. 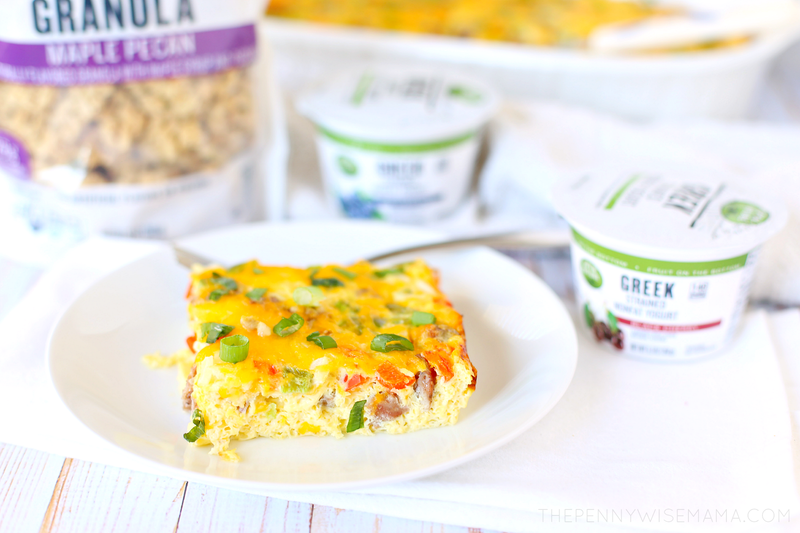 This recipe is perfect for feeding a crowd or making ahead for busy mornings. It holds up well in the fridge and can easily be warmed up in the microwave to eat at home or take on the go. 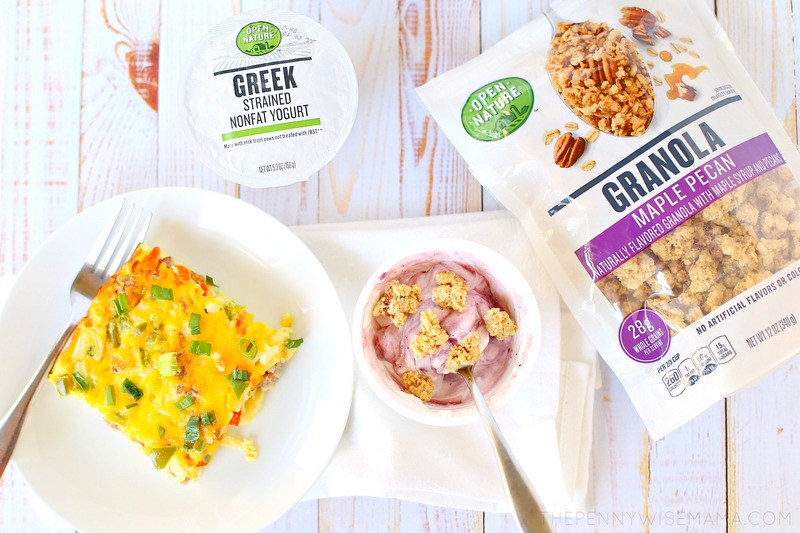 Pair it with Open Nature Greek Strained Nonfat Yogurt topped with Open Nature Granola for a delicious, hearty meal! 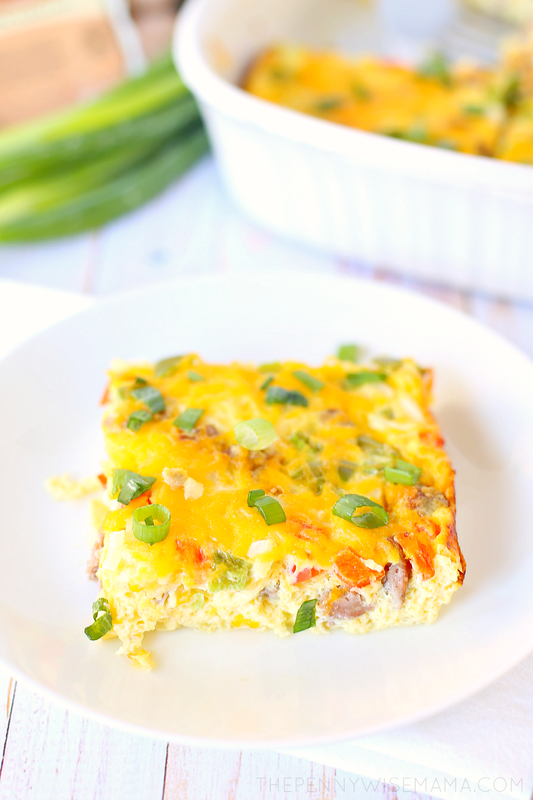 This Cheesy Low-Carb Sausage Egg Casserole is perfect for feeding a crowd or making ahead for busy mornings. 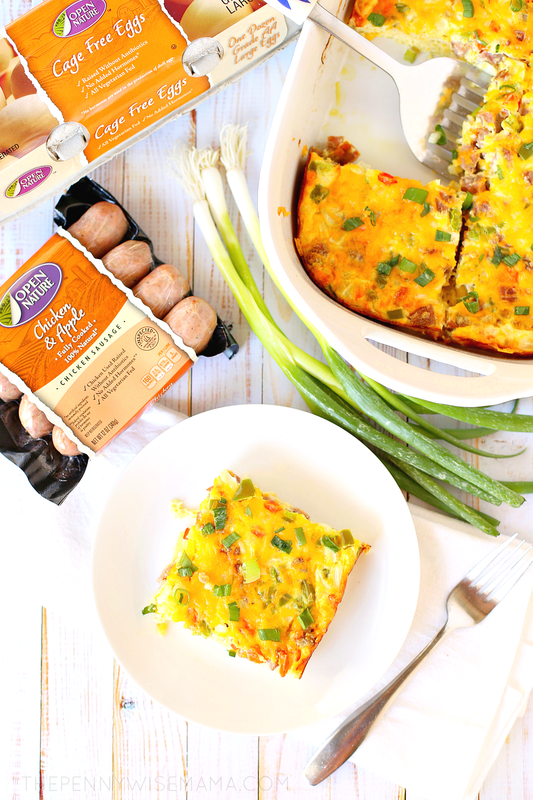 Featuring fresh veggies, cheddar cheese, and Open Nature® Chicken Apple Sausage and Cage Free Brown Eggs, it’s full of flavor and easy to prepare! Preheat oven to 350°F. Remove chicken sausage from package and cut into small chunks. Chop yellow onion, red bell pepper, and green bell pepper. Set aside. In a medium bowl, combine eggs and milk. Whisk until mixture is bubbly. Add sausage, chopped veggies, and 1 cup of shredded cheese to bowl and stir well to combine. Pour mixture into a greased 13x9 baking dish. Bake for 40-45 mins or until edges turn brown. Top with remaining cheese and return to oven to bake until cheese has melted. Remove from oven and top with green onions. Cut into squares and serve. Enjoy! Looking for good, clean food? 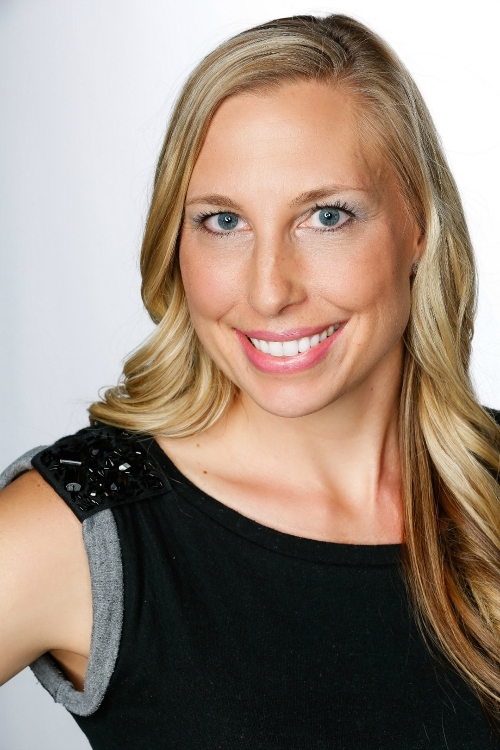 Try Open Nature products! Made with minimal processing and no artificial ingredients, Open Nature products can be found in my area exclusively at Safeway and at all of the Albertsons Companies family of stores, including Albertsons, ACME Markets, Jewel-Osco, Vons, Pavilions, Randalls, Tom Thumb, Shaw’s, Star Market, and Carrs/Safeway.